Has everyone got a handle on EBITDA? In a few words, EBITDA is a measure of cash earnings from the real business, the day to day stuff that creates value for customers, users, and stakeholders: cash, as Earnings, Before any Interest payments, Taxes, or Deductions for non-cash items like depreciation of tangible assets and Amortization of intangibles. Fair enough. 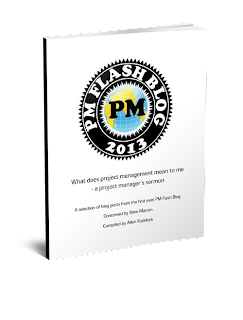 But since this a project management blog, why should we care? Well, for one we PMs are in the value business; mostly we're in the earned value business. When the project is successful and earns its value, then it's ready for the business. The deliverables can go on to deliver on EBITDA. What about NPV and EVA you ask? Haven't we PMs been told by CFOs that the way the business goes about measuring financial success in the business domain is with measures of discounted cash flow (DCF), like NPV (net present value) and EVA (economic value add)? And, haven't we all seen the IRR (internal rate of return) calculations that demonstrate that this project can't miss (at least in terms of discount)? [Private equity] is ..." much more cash flow oriented than [publically traded businesses]. I think it is the nature of the private equity industry in general – Capitalism at its finest in my opinion – very investor focused. Our primary measure is EBITDA (basically a proxy for cash flow). Our focus is converting EBITDA into operating cash flow as efficiently as possible, while balancing the business needs (investments) against these demands. At the end of the day, the primary responsibility of the CFO is to prioritize the various projects competing for the limited capital budget. The valuation tools [EVA and NPV] ... are useful, but not the primary tool that I use...[which] is business judgment: does it make sense; who is responsible for the project; do I have confidence in them; is it critcal? OMG! Business judgment: what will they think of next?